One of the reasons why I secured an SSL certificate is to make sure that this blog will remain clean and secure for all its visitors. If you’ve read my post on being back to blogging after a few days of being offline, you’d know that this site was hacked and tagged as dangerous by Google. Which is a bad thing to happen to a site. I managed to make it clean and I intend to make this site stay clean! I closed the comment section of this blog. The reason? Antispam Bee is notifying me left and right about CSS hacks the plugin has been blocking ever since I put back this blog up. Instead of giving the hackers and bad bots any reason to infiltrate my blog again, I decided to close the comment section of this blog for the meantime. I don’t want to find myself in the same position as when my blog was tagged as carrying malicious apps. Compromised. Hacked. Malware carrier. Suspicious site. Dangerous. Threat. Those are all the words thrown at my blog by various sites due to a malware that entered my blog through the backdoor. According to one of the experts I talked to, there are various ways that a hacker can compromise a site. I am not much of a tech person so I didn’t list everything down anymore but took note of one important thing: regularly change passwords! I’ve been so complacent, not bothering to check my blog as regularly as I used to, and trusting that as long as my chosen password is strong, hard to guess, then everything’s okay. I was wrong. My site was tagged as a malware carrier! I am not ashamed to tell you that I panicked. Why wouldn’t I? This site is my baby. It’s 10 years old already, turning 11 May of this year. 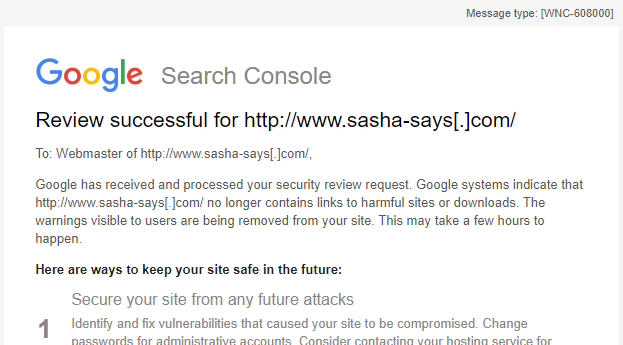 Sasha-says.com is also a source of income for me so losing this site is a big no-no. I scanned my site for malware. I used Sucuri SiteCheck and Comodo cWatch. Both tools are free. I will write separate entries for both malware removal sites and will tell you what I think about each. I deactivated my site. When I found out that my site actually had malware in it, I deactivated my site by taking down all the posts and erasing everything that Sucuri said had malware or virus in it. I deleted the WordPress installation after saving some important details like the content of the sidebar and the pages. Then I deleted everything. I moved to a new webhost. This is optional especially if you know how to really clean out your cpanel but since I am in such a hurry to bring back my site to its old glory, I bought a new webhosting account. I will also write a separate entry for it. I added this domain there and installed WordPress anew. I submitted my site to Google Search Console Team and asked for a review. It will take a maximum of 72 hours for the review to be completed but mine took less than 24 hours only and I got an email from Google Search Console Team that my site is now clean and no longer poses a threat to its visitors. I purchased an SSL Certificate from Comodo. I want to assure this site’s visitors that my site is 100% clean and secure. Again, this is optional but a good blogger-friend of mine advised me that if I want to maintain a good site, I must invest in it. I installed a good anti-spam plugin. I used to have Akismet installed but since it now asks for payment for the use of their plugin, I opted to find an alternative. I found Antispam Bee! I read the reviews and it is the plugin I need. So far, so good. I installed and activated it before I opened this blog again. So far, it has blocked 6 comments meant to hack my css. I tested this site in different browsers: Google Chrome, Microsoft Edge, Safari, Samsung Internet Browser (through my best friend), and ASUS Internet Browser. No more warning from Google! My blog is now back to regular programming. Have you noticed that there are less and less amazing WordPress themes that are free these days? I wanted to change the theme of another blog that I maintain. I searched some sites I used to get themes from but I found that they are being sold now. I do understand that theme developers need to earn from their work but I miss the good old days when there were so many free themes to choose from. These days, one site has one free theme to offer, usually in exchange for a subscription to their blog. The rest of the themes are being sold or contain ads. Another thing I noticed, WordPress themes have become too professional-looking. Most are created ala-magazine type where the front page has a slider and posts are displayed like small articles in magazines. Blogging has become too cold and the warmth provided by old free WordPress themes is no longer there. You may have the greatest content in the world on your blog, but if nobody is reading what you’re saying, what’s the point? There are over 100 million blogs on the internet, so it’s little wonder that some of them get lost along the way. But don’t despair! Your little corner of the world wide web doesn’t have to go unnoticed. 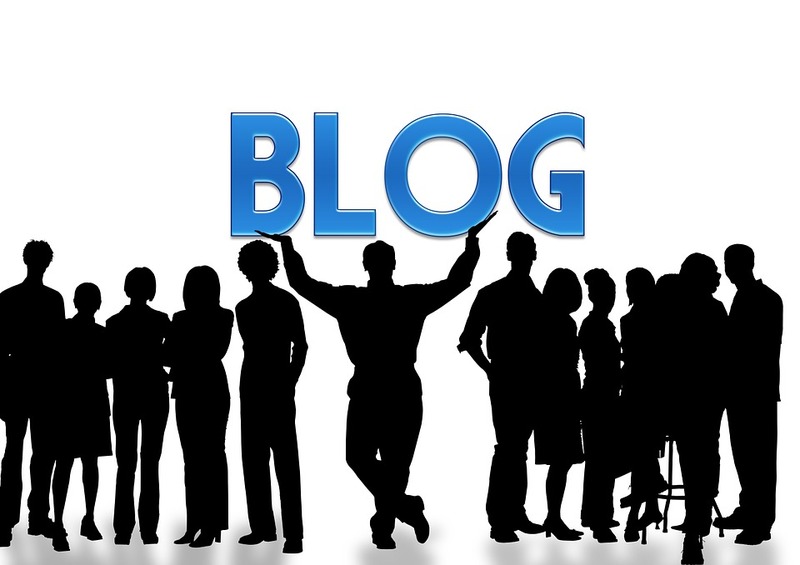 We have some great tips for you here, ensuring your blogs receives the attention it deserves. There are ways to push your blog to the forefront of search engines, and we will get to those in a moment. However, you can at least make sure your blog is included on a search engine, by submitting your URL through the ‘submit’ link (or similar) on a search engine page. You may not be on page one of the search results, but you can still be found by people looking for blogs such as yours. This is how you can push your blog to the first page of Google. SEO (search engine optimisation) is an effective tool to make sure your blog gets noticed by search engines, through the effective use of keywords and links on your site. You can also employ other agencies to provide backlinks to your blog from other websites. The new backlink software for agencies from SEOJet will help promote your blog, ensuring you rise up the search engine rankings. If you aren’t updating your blog with decent articles every day, you aren’t going to attract an audience. Other blogs are only a click away, so be sure to maintain the interest of potential readers by posting frequently. The more you post, the more chances you have of popping up on search engines too. If you struggle to write something every day, you could also employ a freelancer or an agency to provide relevant articles for you. You will have to pay them a fee, of course, but there are many talented writers out there who can help. You will have noticed that the articles on our site contain tags, and that is because they are easily picked up by search engines. It only takes a few seconds to add a tag, and you need to make sure it is relevant to the article you have written. An article on home improvement, for example, could have the words ‘home decor’ or ‘renovation.’ When using social media, you should also add hashtags, as this will connect you to other users with similar interests. Finally, don’t sit back and assume people will find you, despite the points listed above. Get yourself noticed online, and join in with a wider community. Contribute to other blogs, promote yourself on social media, and join online forums. The more people get to know about you and your blog, the better. 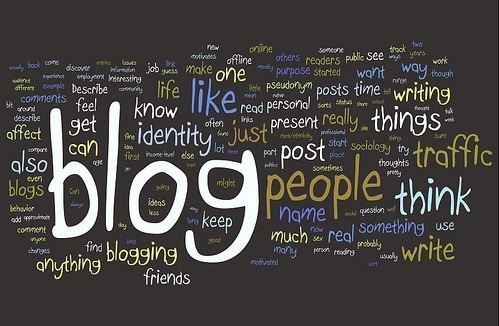 Don’t be shy, you have a voice, so use it within your blog as well as to the wider blogosphere. 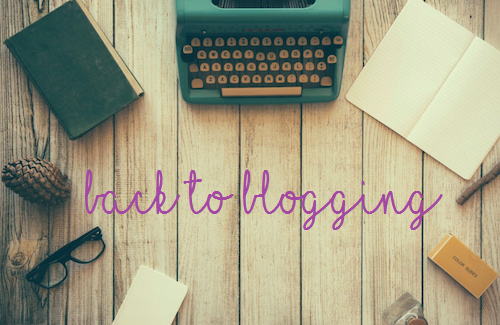 I began my blogging journey a long time ago, back when I was so stressed out at work I didn’t know any other way to get it all out of my system. I discovered building sites and transforming it into a digital journal. I enjoyed that so much that I began exploring blogging more. Then, I discovered Blogger.com where I realized blogging is a passion of mine. I began taking it seriously, cultivating a reputation for being one of the bloggers to beat that time. I cultivated friendships all over the world. Blogging became an outlet for all the frustrations, stress and disappointments in my life. It also became the platform where I celebrated all my successes and achievements. Blogging became a lifestyle for me. I’ve blogged regularly, almost daily, for nine years straight. I begun as a regular blogger who just wanted to engage her audience on the daily happenings in my life and theirs, too. I would write an entry, engage my blogger-friends who would leave comments, and would hop onto their blogs to leave my two cents on whatever was the drama in their lives then. And then I met a blogger who introduced me to pro-blogging. From a regular blogger, I became a pro-blogger. Not in the leagues of those big ones but just a small pro-blogger who wanted to make a buck off what I am enjoying doing. I blog and earn at the same time. That’s a good thing! Right? Not everyone think so. I remember losing so many of my blogger-friends. They were disappointed that I joined the bandwagon. But I couldn’t care less. I am earning money from something I enjoy the most! Eventually, those who turned their backs on me approached me to ask how to monetized their own blogs. I taught some and became friends with them again. Blogging has evolved. That much I can say. I don’t know if I still like the old way of blogging versus the style right now. What I can definitely tell you is that blogging will continue to become a lifestyle to me.